"Mergers & Acquisitions is the story of Tommy Quinn, a recent Georgetown graduate who has just landed the job of his dreams as an investment banker at J. S. Spenser, and the perfect girl, Frances Sloan, the daughter of one of New York's oldest moneyed families. As he travels from the most exclusive ballrooms of the Racquet and Tennis Club to the stuffiest boardrooms of J. S. Spenser, from the golf links of Piping Rock to the bedrooms of Park Avenue, and from the debaucheries on the yacht of a Mexican billionaire to the Ritalin-strewn prep-school dorm of his younger brother, he finds that the job and the girl are not what they once seemed. 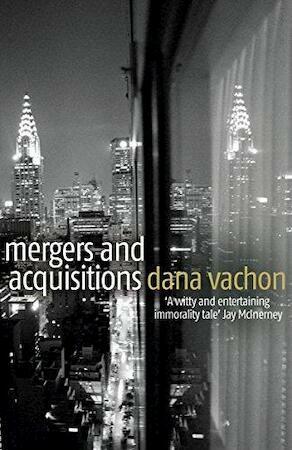 Sharply written, fast-paced and bitingly witty, Mergers & Acquisitions is a compulsively readable story of Manhattan's young, ambitious and wealthy. Set against the backdrop of money, lust, power, corruption, cynicism, energy and excitement that is Wall Street, it is suffused with an authenticity that only an author who lives in that world can provide. A former investment banker at JPMorgan, Vachon offers an insider's point of view on the financial scene, and he knows the moneyed turf of Manhattan inside out.